As a member of International Theological Commission, then Fr. Joseph Ratzinger approved the ensemble of theses presented by the ITC for Catholics. These theses received the unanimous approval of ITC members in 1972. Among those theses are the two reproduced below, which state that Catholic orthodoxy should not be understood as adhesion to a body of doctrine, the Creed, but rather within the framework of the "walk of the faith." That is to say, the faith can present itself differently in each time period of History. Taking this principle to its final consequences, heresies - which were always abhorred by the Catholic Faith - would be nothing more than a different presentation of the walk of the faith, and thus, should be accepted and assimilated. Such a notion of orthodoxy, however, is in complete opposition to the Magisterium of the Church previous to Vatican II. The ITC published the conclusions of its October 5-11, 1972 meetings in 1973 in German. 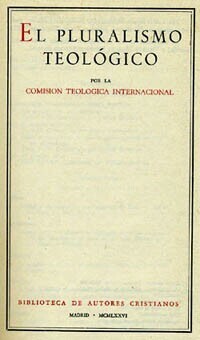 We are using the Spanish edition published in 1976. Right top, the frontpiece Theological Pluralism. 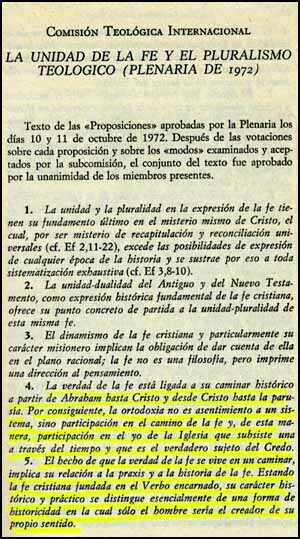 Right, a photocopy of theses 4 and 5; below left, our translation of the Spanish text highlighted in yellow. Thesis 4 - The truth of the faith is linked to its historic march from Abraham to Christ, and from Christ to parusia [His second coming]. Consequently, orthodoxy is not acquiescence to a system, but participation in the walk of the faith, and in this way, participation in the 'I' of the Church, which subsists through time and which is the true subject of the Creed. Thesis 5 - The fact that the truth of the faith is lived in such a walk implies its relation with the praxis and the walk of faith. Since the Christian faith is founded on the Word Incarnate, its historic and practical character is essentially distinct from a type of historicity in which man alone would be the creator of his own meaning..